Antoine Augustin Cournot (28 August 1801 – 31 March 1877) was a French philosopher and mathematician who also contributed to the development of economics. in 1823 he took a license degree in mathematics at Sorbonne University. He then became the private secretary of a field marshal who required assistance in writing his memoirs. This position does leave Cournot with considerable time for his own pursuits, for in the course of his ten years in the field marshal's employment he took two doctoral degrees, one in mechanics and one in astronomy. In addition, he published a number of articles and even acquired a degree in law. Subsequently, Cournot held positions as professor of mathematics, chief examiner for undergraduate students, and rector of Dijon Academy. By the time Cournot died in 1877, he was nearly blind. Cournot was mainly a mathematician, but did have some influence over economics. His theories on monopolies and duopolies are still famous. In 1838 the book Researches on the Mathematical Principles of the Theory of Wealth was published, in which he used the application of the formulas and symbols of mathematics in economic analysis. This book was highly criticized and not very successful during Cournot's lifetime. He did attempt to rewrite it twice. However, it still has influence in economics today. Today many economists believe this book to be the point of departure for modern economic analysis. Cournot introduced the ideas of functions and probability into economic analysis. He derived the first formula for the rule of supply and demand as a function of price and in fact was the first to draw supply and demand curves on a graph, anticipating the work of Alfred Marshall by roughly thirty years. The Cournot duopoly model developed in his book also introduced the concept of a (pure strategy) Nash equilibrium, the Reaction function and best-response dynamics. Cournot believed that economists must utilize the tools of mathematics only to establish probable limits and to express less stable facts in more absolute terms. He further held that the practical uses of mathematics in economics do not necessarily involve strict numerical precision. Today, Cournot's work is recognized in econometrics. He was also a teacher of political economy and mathematics to Auguste Walras, who was the father of Léon Walras. Cournot and Auguste Walras persuaded Léon Walras to try political economics. 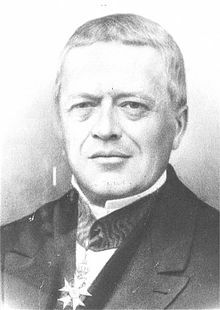 Cournot is also credited to be one of the sources of inspiration for Léon Walras and his equilibrium theory. In the field of economics he is best known for his work in the field of oligopoly theory—Cournot competition which is named after him. ^ Sandmo, Agnar (2011). Economics evolving. Princeton: Princeton university press. p. 146. ISBN 9780691148427. ^ Antoine Augustin Cournot (1897). Researches Into the Mathematical Principles of the Theory of Wealth. Macmillan. Touffut, Jean-Philippe, ed. (2007). Augustin Cournot: Modelling Economics. Cheltenham: Edward Elgar. ISBN 1-84720-654-9. For an early 20th century evaluation see: Chisholm, Hugh, ed. (1911). "Cournot, Antoine Augustin" . Encyclopædia Britannica. 7 (11th ed.). Cambridge University Press. p. 321. O'Connor, John J.; Robertson, Edmund F., "Antoine Augustin Cournot", MacTutor History of Mathematics archive, University of St Andrews .